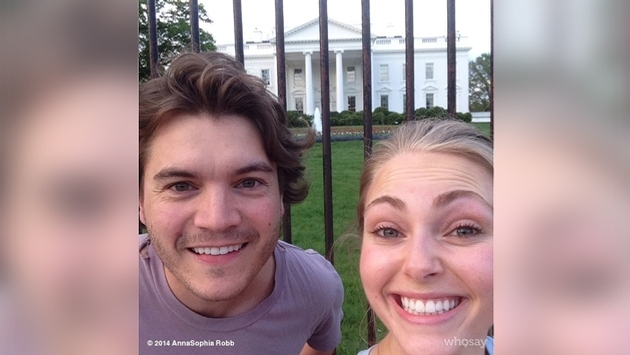 AnnaSophia Robb & Emile Hirsch Get Cozy In Washington D.C.
AnnaSophia Robb, 20, and Emile Hirsch, 29, dashed and dined around Washington, D.C. together over the weekend. The pair, in town to attend the annual White House Correspondents' Dinner on May 3, took a moment to pose during a jog around the White House on Friday morning. "We're takin' over!" the "Carrie Diaries" star captioned the cute May 2 Instagram photo. Later that night, the "Lone Survivor" actor, who welcomed son Valor with an ex-girlfriend in November, and AnnaSophia “were totally chatting it up,” in STK DC steakhouse at the Creative Coalition’s annual Celebration of the Arts in America event, an onlooker tells Radar Online. Sadly, AnnaSophia is based in New York, while Emile calls Hollywood home. But if "The Carrie Diaries" gets canceled by the CW, which seems very likely, AnnaSophia won't be tied down to the East Coast any longer. You know what they say: couples who travel together, stay together. Perhaps the same is true for two people who meet while traveling.